SH MonsterArts “Legendary Godzilla” First Image! In honor of the King of the Monsters’ triumphant return to theaters, Bluefin has released the first image of a new MonsterArts figure featuring the new Godzilla design! Labeled “Legendary Godzilla” (as tribute to the new film’s production studio) this new MonsterArts is an impressive sight! Sadly no price details have been revealed at the time of writing, and the release window is only hinted at- “Coming later 2014.” Stay tuned to TokuNation for further details! Godzilla Snickers Commercial, Actual Suit Used! If you thought the king of monsters would only be in CG this year then you were wrong! In a pretty off the wall commercial for Snickers candy bars, we see an actual “classic” Godzilla suit used, even though it’s promoting the 2014 reboot movie featuring the CG redesign of Godzilla! Watch the full 46 second commercial to see Godzilla, riding ATV’s, playing Ping Pong, Pranking his friends, picking up the ladies, water skiing, destroying the city, and enjoying a tasty snickers bar! Godzilla 2014 Trailer #2 is LIVE! 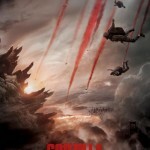 Check out the brand new trailer for the upcoming movie from Legendary Pictures, GODZILLA!! Godzilla destroys theaters on May 16th! So what do you think of this new image? Is this just a misinterpreted scale on the poster artists part? 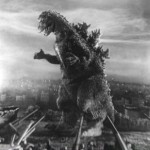 Or could Godzilla actually be this gargantuan? Sound off in the comments by clicking “Discuss on the TokuNation Forums” at the bottom of this article. 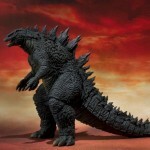 NECA Announces Godzilla Figures Featuring 1954 and 2014 Designs! More good news for NECA collectors! The King of the Monsters will be joining their lineup of toys later this year! *GOJIRA 1954: From one of the most anticipated movie releases this year, NECA announces the relaunch of the classic Godzilla franchise. The first 6″ tall figure is highly detailed and fully articulated and 12” long from head to tail! Over 25 points of articulation and a bendable tail. *GODZILLA 2014: From one of the most anticipated movie releases this year, the relaunch of the classic Godzilla franchise. This 12″ tall figure is highly detailed and fully articulated, and 24” long from head to tail! Over 25 points of articulation, bendable tail, and sound effects.This classic movie monster has never looked so good in toy form. Definitely sounds like fun times ahead for kaiju collectors! 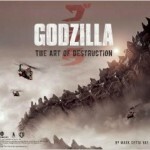 The Lebanese Cinema Movie Guide has reported that the 2nd trailer for the upcoming Godzilla 2014 Movie will be released online on February 7th. Stay tuned as that’s not too long from now! The boys of Talkin Toku at the Nation are at it again in episode 002. Join site administrators Kickback, Den-O, and Sentai Tamashii as they talk about the Godzilla 2014 trailer, Tokkyuger pre-orders, Kyoryuger, Power Rangers Megaforce and Super Megaforce, and continue to fangasm about Kamen Rider Gaim. Listen as Sentai Tamashii has his mind blown after realizing what exactly happened in episode 09 of Kamen Rider Gaim, Kickback continues to struggle to pronounce Japanese words, and Den-O‘s “oh God stop, I can’t do this!” moment. Click here to find us on iTunes! Click here to direct download the episode! If you have a question that you’d like to ask the crew on their next podcast, please send an email to podcast(@)tokunation(dot)com. 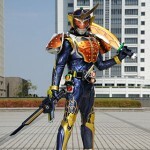 The question we have for our listeners is this – Does the “Arms Change” line for Kamen Rider Gaim, with their incredible posability and “arms change” features, cause you any hesitation on purchasing the upcoming S.H. Figuarts Gaim & Baron figures scheduled for May 2014? Send us an E-mail or post in our discussion thread and we’ll use the best comments in our next show! Thanks for listening and we’ll see you one more time before Christmas! New actors and actresses have been added to the cast of Godzilla 2014! 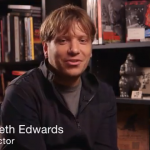 Thanks to Dread Central[/URL] for the heads up!